The rather unfortunately named "Indigenous Tourist Transport Alliance Group" offer daily trips from Baguio to Banaue using 12 seater vans (including driver). The rate is P350 as of March 2016. Travel time is about 6 hours going round a very scenic trip through Nueva Vizcaya and just around Mt. Pulag. Their terminal is located just beside the Victoria Apartments on T. Alonzo Street, just 10 minutes north of Burnham Park. Vans leave every 2 hours starting from 630AM til 730PM. There are jeepneys going from Bontoc to Banaue (P150) and even Sagada to Banaue (P195) during peak season or holidays. Jeepneys arriving into Bontoc from Sagada (and no doubt other jeepneys and buses) are sometimes met by drivers who can offer you a minivan journey on to Banaue, which takes around 2-2.5 hours, we paid 150 Piso each for this in May 2014. There does not appear to be a fixed schedule for these but we left Sagada by jeepney at approximately 1220, reaching Bontoc at 1300, our van set off shortly before 1400 and we were in Banaue by 1610. Buses heading to Tuguegarao (e.g. Baliwag transit, Victory, Florida transport inc., etc.) pass by the town of Solano and Bagabag junction. Several jeepneys ply the Solano-Banaue route or the Solano-Lagawe, Ifugao route. Or after town of Solano get down at Bagabag junction and get jeepney to Lagawe (Php50, May 2015). Jeepney going to Lagawe is more frequent, so you may want to take this rather than waiting long time. From Lagawe, take another jeepney to Banaue (Php35, May 2015). Just to add, there is decent restaurants and bakery shop at Lagawe town if you want to take a break before heading to Banaue. Get off any bus between San Fernando (La Union) and Vigan on the llocos highway at Bitalag, which is a few kilometres north of Tagudin. As you approach Bitalag you will seen a road sign for a turnoff to Bessang Pass. Take a minivan from Bitalag to Cervantes (₱150, 2 hours). From Cervantes take a minivan or jeepney (which passes over the Aluling Bridge which opened in March 2013, 35 years after construction commenced) either direct to Bontoc or if there is no direct service then to Bauko (₱70, 1 hour) and then another from there to Bontoc (₱50, 1 hour). Another route between Cervantes and Bontoc is via Abatan, but this is longer. Jeepneys (converted jeeps/bus) and tricycles (trikes) (little motorcycles with side cars) are easily available around Banaue. Vans can be hired with driver/guide. Expect to hike some to great places to see that are not on the roads. There is a public jeepney plying the Banaue-Batad (Saddle-point) (start of trek to Batad village) route daily. See Get Out, below for more info. You can also hire a Van or jeep before your arrival, and you'll be picked up at the terminal, drive you to your hotel, and take your booked sites. this could be more fun, as it will make your trip more adventurous. Sign in Banaue describing the rice terraces. Many kinds of carved woods. Native rice wine or sugarcane wine at all inns and lodges. The grand old lady, Banaue Hotel, is probably the priciest option you'll find but offers regular cultural shows in the evenings (Ifugao dance and music) that are also open to non-guests. The pool is small but a nice place to hang out when you're tired of trekking up and down rice terraces. Closer to town, there are a multitude of hostels and guesthouses offering much more reasonably priced accommodations. Terrace just outside Banaue town. There are several internet cafes around the town, the rate ranges from 50 to 20 pesos per hour. Flashlights: Banaue and the surrounding villages have poor lighting at night. Be sure to bring a torch. Be careful of fixers and barkers who board buses coming into Banaue. They get on about 15 minutes away from town, and ask to see your tickets. They pretend it's all official, but they are scammers who put you into "free" rides to town, as long as you book nights with the hotels who give them commissions. Avoid these people. If you need any help with finding local public transport, head to the Tourist Information or ask around the marketplace. The cartel operating in Banaue will also offer to transport you to Bontoc or Sagada, but for double the going rate. Batad. While the rice terraces of Banaue are mud-walled, those of Batad are stone-walled. They form an amphitheatre and are an impressive sight. 15km followed by a 15 minute downhill hike, but worth it. There are a number of hostels and guest houses in the small village there, overlooking the rice terraces. If weather and time permit, Batad is probably a better place to spend the night than Banaue. There is a public jeepney from Banaue to end of the paved road route daily. Banaue to Batad is around 2-4 pm while Batad to Banaue jeepney is around 9-10am. They may take extra trips during the peak season (e.g. Holy week). Head on to the Banaue public market and ask around. Fare is ₱50 for tourists, as is printed on the official boards. The driver will of course try to charge you much more. During busier times (public holidays, extended weekends), extra jeepneys will go up to Batad Saddle Point in the morning (7-8am). 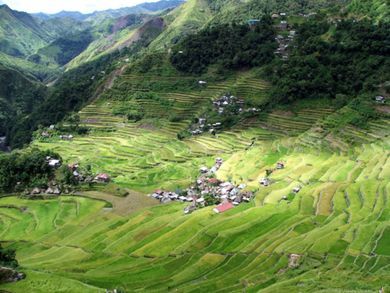 If you do not have time to spend the night in Batad, it is also possible to do it as a day trip, organise with a tour operator in Banaue, but be very careful of scammers. Rented jeepneys/vans that bring people to Batad will leave empty (or with some free seats at least) back to Banaue, so they should be glad to take you with them for the normal fare. Unfortunately, they will try to charge you extortionate prices for the trip, so it is best to get the public jeepney in the morning. In case you do not find any jeepneys or other people that might take you with them to Banaue (just ask around), you can hike down for 2 hours to reach the main road at Batad Junction. More public jeepneys will ply that route and you can make it back to Banaue from there. In the worst case scenario, Batad to Banaue is a 16km walk, mostly downhill. Bangaan: An alternative to Batad and easier to access, since it is only a 20 minutes walk from the main road towards Mayoyao. Hapao: A half-day trip from Banaue. More terraces. Steep steps lead down to some, giving easy access for a close-hand inspection. Near Hapao there is also a hot spring (45 minutes from the main road), where you can bathe. You can get to Hapao by using public transport that travels the route Banaue - Hungduan. Mayoyao: There is a bus that plies the route Banaue-Mayoyao at 12pm and reaches Mayoyao at around 4pm. Bontoc and Sagada: Bontoc is a busy town but has an excellent museum of Ifugao culture. Sagada has the impressive Sumaging limestone cave (take a change of clothes and leave your best shoes in Banaue), the Burial Cave (Lumiang) and hanging coffins. En route to Bontoc you pass the incredibly beautiful Bayo terraces. There is a jeepney at about 08:00 from Banaue to Bontoc (₱150), and vans around 11am, 12am and 1pm from the market square in Banaue. During busier times there are some jeepneys that go all the way to Sagada, but this depends on the demand. An entire van to Sagada can also be rented for ₱1,000 from the market square, although be prepared to bargain. Otherwise change to a jeepney in Bontoc to get to Sagada (50 minutes, ₱45). By hiring a van in Banaue (ask in the market) you can visit these two centres as a day trip. Beware of the local scammers who will charge you ₱300 for the public jeepney to Sagada (it should cost ₱195). Ilocos Sur Province, [[Vigan], San Fernando (La Union): Connections are available via Bontoc to the West coast. This is a quicker route than by swinging south via Baguio. This page was last edited on 1 April 2019, at 07:50.